Anytime I have to put a camera looking straight down over anyone it gives me the willies. I hate it. I'm in a constant state of nervousness until it's over. The above shot is an extreme example. Sixty floors up, over a bunch of schoolchildren. You can't really see the whole setup, but it's off a Peewee sideways on track and it's a left to right move of about twenty feet. Shots like this are nerve wracking enough when you're doing the standard offset-on a riser-over-the-bed-shot. When you're eighty feet up, it just magnifies it. Always remember to do any rigging, attaching the camera to the head, lens changes etc. before you swing the offset out. I actually prefer to swing the actual offset rather than the R.O. because I can see the bolt and how much engagement it has as opposed to the R.O. knob where the threads are hidden. Don't forget to safety the matte box as well as the camera and double check everything before swinging it out. If there isn't a "Jesus pin" on the plate, screw a 3/8" bolt into one of the holes in the plate below the camera. On this setup, I have a daisy chain through an eyebolt, around the handle and around the rods just for a little more piece of mind. Some lenses have little tabs with holes for wire safeties too. I have seen a lens fall out of the mount and hit a stand-in so don't take anything for granted in this situation. Whenever I'm in the old lock off looking down at an actor position, I'll usually support the arm too. It's overkill but if the hydraulics ever pick that moment to fail, someone's going to the hospital or worse. Sometimes AC's will laugh at me for taking all of these precautions but I'd rather over rig than under. 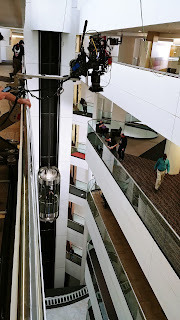 Anything that can go wrong will go wrong and a matte box or focus motor from that high up could kill someone. Don't take shortcuts. I've added a new link in the long neglected links section for filmtoolkit.com. Give them a look. It looks like some well researched info. I've had a little more time to post lately mostly because I've been doing B Camera on the last two shows and frankly I'm not as tired as I normally would be. Plus, both are in the Marvel universe and that means ten hour days. I had the opportunity to work with my old buddy the legend Brad Rea on the last one which was a treat, and I'm helping fill in for a friend who needed some time off on this one so I'm getting to work with some other A camera guys who I wouldn't normally see. It's always kind of fun to team up on a show with another A camera guy, although doing B camera can leave you feeling a little left out when you're watching the other guy in the middle of it all. Anyway, it can be a nice break from the action and I get to see some friends without all the pressure. I hope you all have a safe and joyous holiday with family and friends. Something happened today which gave me an idea for a post. Since I have a long turnaround (a week of days into a Friday night exterior) I find myself with a few hours to fill up while I try to force myself into nights. Anyway, the inspiration was an actor committing what I call a double tap. I was pulling back with an actor as he lurched toward, then descended a small staircase. We'd done a couple of rehearsals and at least two takes. No problem. He lurches, I start the pullback. and he stops. He Stops. For about a second, then goes into his descent down the stairs. By this time I was a good two feet further than I should have been, but there was nothing to do but slow down and keep going. This is a double tap, when an actor appears to commit to a movement and suddenly pauses before actually committing. It most often happens on stand-ups or sit-downs. He or she will lean forward, my fingers start to turn the boom control in anticipation. The actor's knees tense. His head starts to rise. The knob turns and the camera ascends in perfect synch with his head. Then, he stops. He settles back, and shoots up in frame toward the ceiling. Except he's not in frame because we left him long ago on our journey upward. At this point I shake my head and fling my arms outward in frustration. I learned long ago that there is nothing you can do about a double tap. They are usually committed by relatively inexperienced actors and hopefully, after the second or third time it happens, the operator or DP will gently explain to them the situation. In any case, if you get double tapped, it's not your fault. Let it go until they get it right. I've been watching and enjoying Mindhunter on Netflicks. It's a beautifully written and shot show that reminds me of True Detective's first season, only a little less tedious and with a little more humor. The dolly work by Dwayne Barr is stellar in addition to the operating by my old friend Brian Osmond. I mean really flawless and my hat's off. Nice work! Ok, time for another cup of coffee as I head deeper into the night.